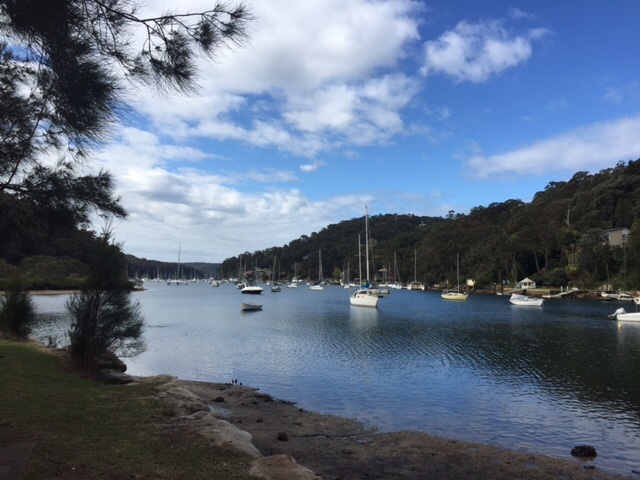 Sadly our planned outing in Tony’s boat with a waterside barbecue to follow had to be deferred until our next visit as the weather was cool and rainy and a mist had more or less obliterated our sea view from the house. 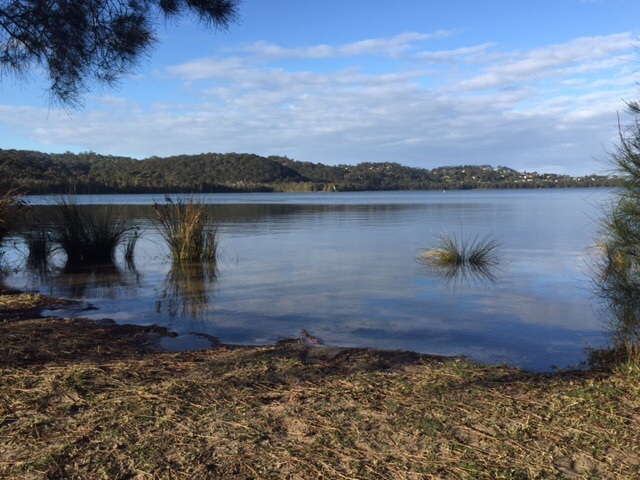 In the event we pottered away the morning waiting for the sky to lift and rain to clear and at about 2.00 pm we set out to go for a walk around the Narrabeen Lagoon. En route we dropped in on the Hacienda del Halliday to collect Justine’s bag and were able to admire the view that had not been possible on Saturday night. It was, of course, absolutely stunning. The sea in the distance another inland lake. 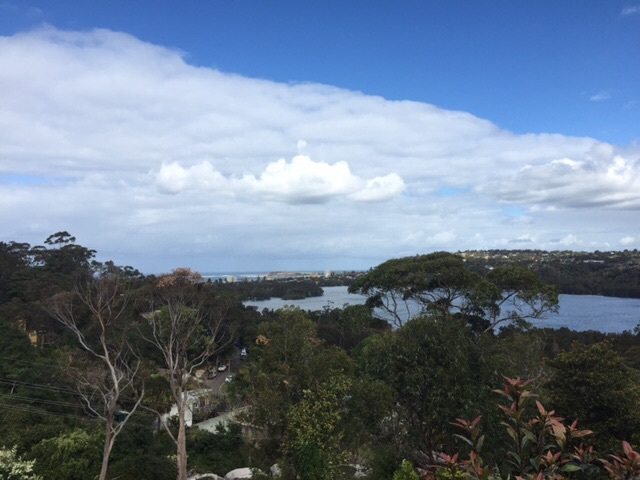 However, not wanting to be dismissive of the view, almost more awesome (in the true sense of the word) was the fact Lesley had talked of gardening at the dinner party and as I looked down from the balcony, sure enough sloping away from us, there was a garden, almost hewn from the rock. She must garden with a pick axe! Her talk of breaking a rib while gardening took on a whole new meaning! 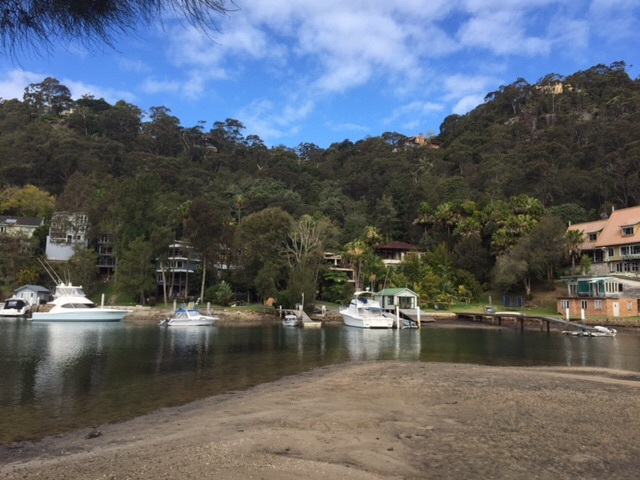 Leaving the Hallidays it was off, first to Pittwater where we should have been boating. 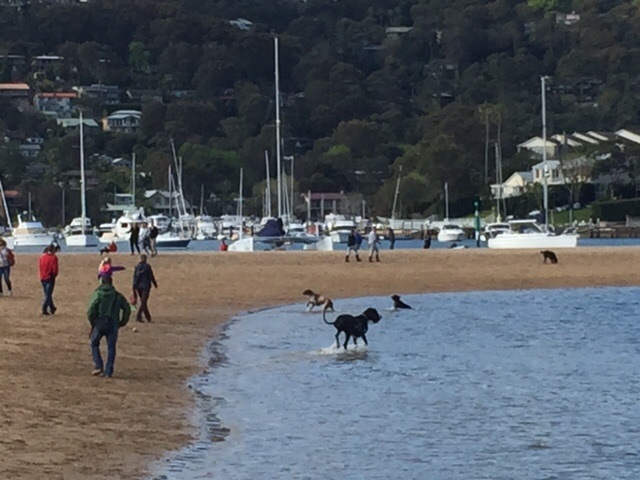 Here dogs were having a great time on the dog beach. It seemed as though we weren’t the only ones pleased to see the day brightening and taking the opportunity to get out! 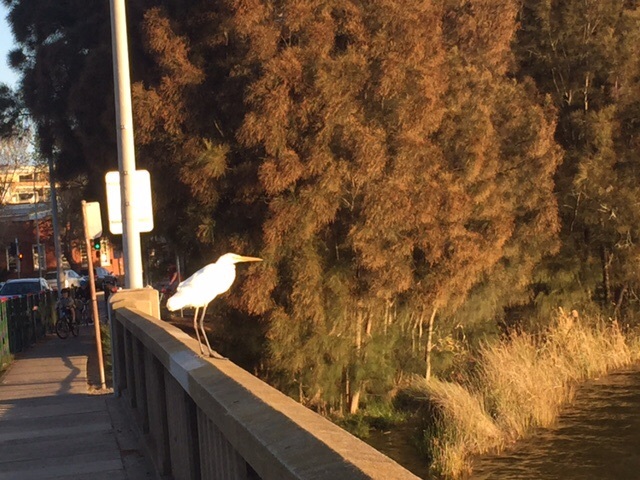 We were then off to North Narrobeen and a stroll around the lagoon. Once again we were to be overwhelmed by the properties surrounding and rising up the escarpment from the water. All seemed to sport balconies, some almost outside rooms, and seemed to come with the ‘must have ‘ appendages of boat/surf boards/four wheel drive. It is a different world but great to have the opportunity to see people living the dream,……… There certainly seems to be no shortage of funds in this area of Australia. 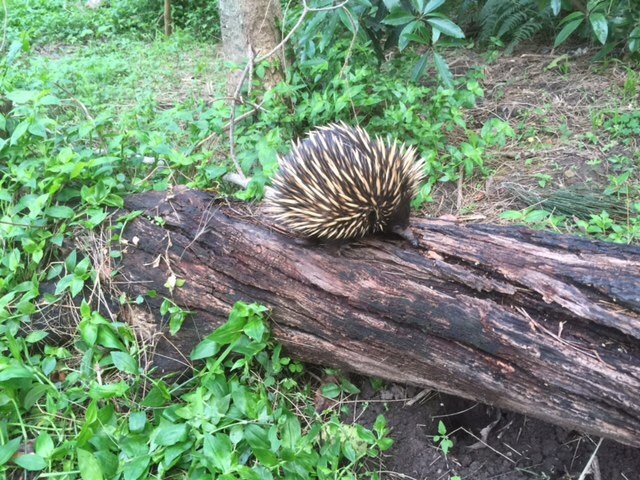 Our walk got off to a very good start with an Echidna snuffling around a log looking for ant by the path. We had not seen one ‘in the wild’ before – so it was very exciting and another thing to tick off in our mental ‘I Spy’ book of Australia! We strolled on – inevitably frequently passed by the cyclist or runner. I loved the the running parents with the children on bicycles almost herding them along – apparently a not unheard scenario for the Family Wightman. They are definitely embracing the life of the young Australian family! it was about 10 kilometres around the lake and a great walk. Unfortunately the pain from the previous day’s boxing training had reached monumental proportions for some among us and while Keith and I skipped along at our normal pace, our two athletes somewhat hobbled and groaned along behind. 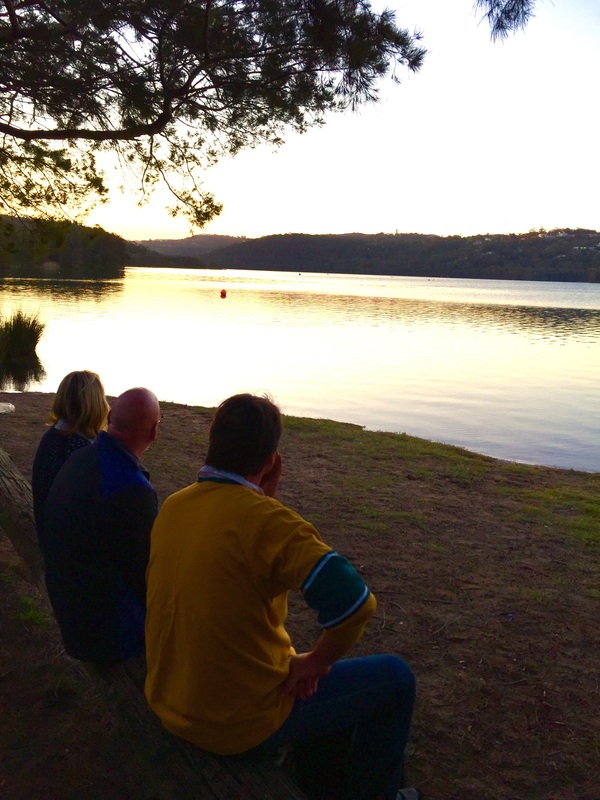 Our reward at the end was to sit and have a cold beer and a few nibbles and watch the sun go down. Nearby a patient fisherman cast his line over the still water. There was high excitement when it looked like he might have caught something, but in the event it was just his hook caught in the weed. 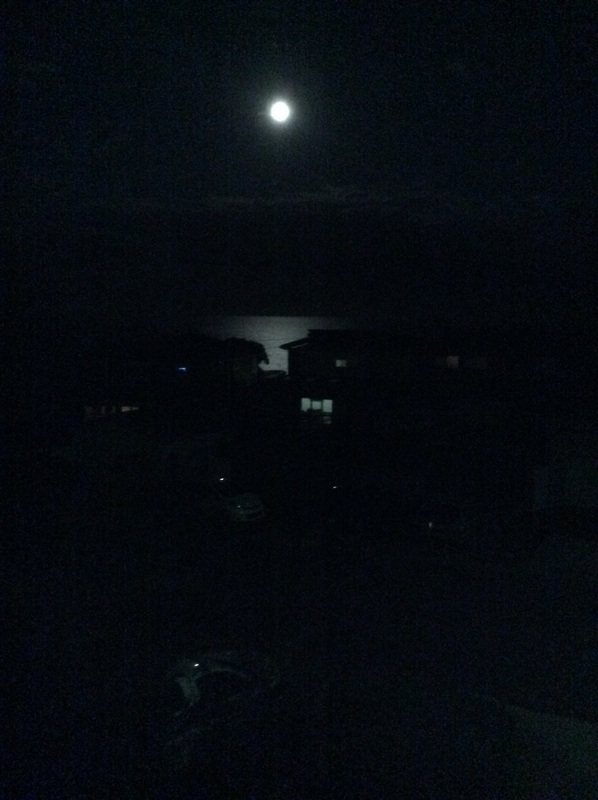 It was then home for meat barbecued on the balcony with a full mooning shining down on the on the ocean.